Inhabitat favorite Yves Behar and his design studio Fuseproject have come up with the perfect bike, catering towards everyday needs. Called 'Local Bike', the cool, green transportation mode fuses the convenience of a bike with the utility of a pick up truck. The result is a three-wheeler that lets riders get around quickly, while making errand running a little easier. You’ve seen your local delivery people riding around with large baskets and carrying platforms – their bikes are clunky, but they get the job done. By comparison, Behar’s bicycle is much easier on the eyes. 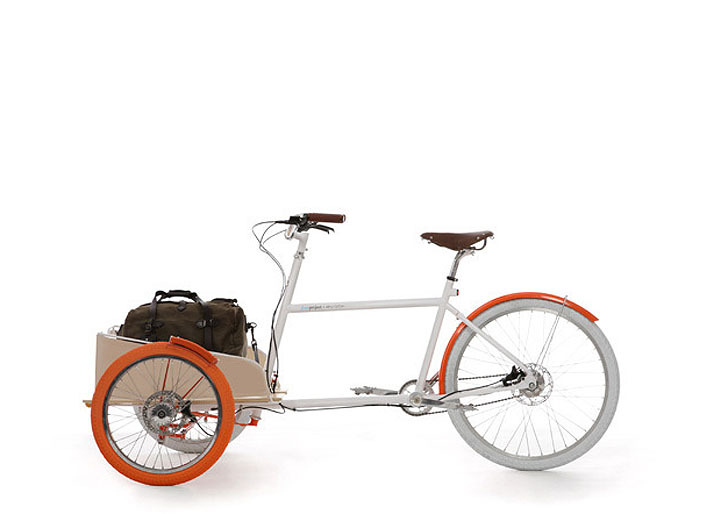 In between two small front wheels sits a flexible beige platform. With high walls and guard rails, the front platform can be used to carry groceries, a case of wine, a kid, a dog, you can even carry your surfboard to the beach! The ultra-durable bicycle has been designed to maintain sturdiness, regardless of whatever load it bears, so there is no need to fear toppling over if the front is too heavy – all within reason of course. The soundtrack for your day is also planned for with the wireless jambox speaker integrated into the bike. Locks, lighting and bags are also included. A removable canvas panel can be attached with belt-like fasteners, which includes a secure box for keys and small items. The bike is also flexible enough for varying street terrain with its 11 gears, and front and rear hydraulic disk brakes – also making for a grease-free ride. The Local Bike was designed not just as a means of green transportation, but to help make city life a little easier. You’ve seen your local delivery people riding around with large baskets and carrying platforms - their bikes are clunky, but they get the job done. By comparison, Behar’s bicycle is much easier on the eyes. 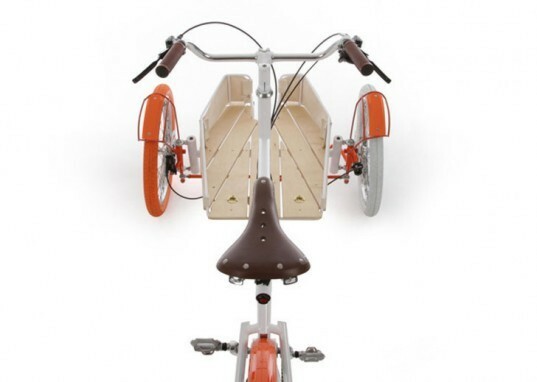 In between two small front wheels sits a flexible beige platform. With high walls and guard rails, the front platform can be used to carry groceries, a case of wine, a kid, a dog, you can even carry your surfboard to the beach! The ultra-durable bicycle has been designed to maintain sturdiness, regardless of whatever load it bears, so there is no need to fear toppling over if the front is too heavy - all within reason of course. The soundtrack for your day is also planned for with the wireless jambox speaker integrated into the bike. Locks, lighting and bags are also included. A removable canvas panel can be attached with belt-like fasteners, which includes a secure box for keys and small items. The bike is also flexible enough for varying street terrain with its 11 gears, and front and rear hydraulic disk brakes - all making for a grease-free ride. The Local Bike was designed not just as a means of green transportation, but to help make city life a little easier.